Rahmir Johnson of Bergen Catholic, the Ramapo girls 4x400-meter relay team, and Kennedee Cox of Paramus Catholic all smashed records at Wednesday's Bergen County Championships at the New York Armory. The Nebraska-bound Johnson burned a 21.68 to win the 200, which took down the Bergen County record, is the fastest time in New Jersey this season and No. 8 in state history. Johnson's 21.68 broke the Bergen County record of 21.80 set in 2008 by Damian Miles of Teaneck. Johnson also placed second in the 55 dash in 6.58 and split 49.5 in the 4x400. 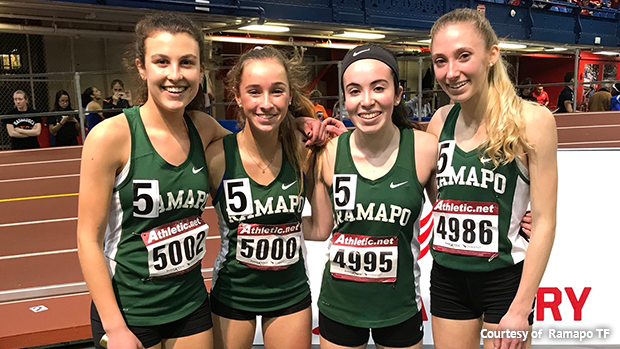 In the girls 4x400, Ramapo's Sophia Schwartz, Cortney Lander, Sarah Adams, and Sophia Vernieri. blew up the track with a red hot 3:55.80, which obliterated the county record of 3:58.04 by Ramapo at the 2016 Eastern States Championships, and is the fourth fastest time by a New Jersey squad this season. Ramapo's 3:55.80 is more than two seconds faster than it's previous season best of 3:58.20. Adams, the NJ. Sec. 1 Group 3 champion in the 800 last.58 week, also won the 600 in a school record 1:35.46, which is No. 4 in Bergen County history and No. 11 in N.J. history. Sarah's sister, Abby Adams, ran on the 2016 record setting 4x400 for Ramapo. Cox, the state leader in the girls long jump at 18-10, won the pentathlon with a Bergen County record and US#3 3,329 points. Mariah Fede of Paramus Catholic captured the 55 in a NJ#4 7.17 and the 200 in a NJ#3 24.99, and she was third in the 400 in 58.59, an indoor PR. The top pole vaulters in the state, Liam Landau of Pascack Hills and Sydney Woods of Demarest, put on quite a show. Landau, who leads the state with a 15-9, made 15-6 to win the boys vault. Woods, the girls state leader at 13-0 3/4, made 13-0 to finish first. NJ#1 Jenna Rogers of Rutherford cleared 5-9 to win the high jump, just an inch off her state season leading performance. Emma Cunningham of Ramsey won the girls long jump (18-0) and triple jump (38-6 3/4). Bergen Catholic senior Braedon Fiume repeated in the 1,000-meter with a personal best 2:33.41. Senior Andy Ambroise of Paramus Catholic won the boys 55 hurdles with a PR of 7.59. Jemel Carter of Paramus Catholic won the boys 55 dash in 6.56, making him the 13th fastest sophomore in the nation. In the boys shot put, four guys went beyond 50 feet with Patrick Passalaqua of Old Tappan edging Tom Vandalovsky of Ridgewood, who unloaded a huge PR of 51-1 3.4. Marc Santonocito of Demarest was third at 50-7 1/2, and John Griffith of Northern Highlands was fourth with a PR of 50-4 1/2.